With the world moving at such a fast pace, humans must adapt to the stress and physical demands of everyday life. Prolonged sitting, inactivity and poor eating habits all contribute to an unhealthy body. Most Americans who experience daily discomfort and pain will seek out a general doctor who runs tests, administers pain shots and writes prescriptions that only provide temporary relief. Many types of modalities on the market can temporarily reduce inflammation, discomfort and help with recovery but do not last long since they don’t work on the cause of these issues. There is a device available on the market now called The Bemer (Bio-electromagnetic-Energy-regulation mat). 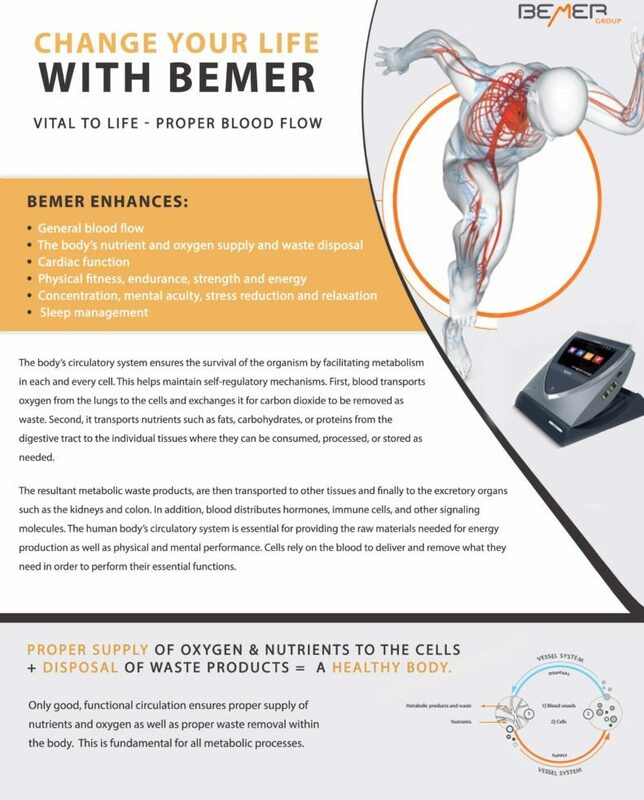 Bemer uses a pulsed electromagnetic field to deliver a patented pulse that helps to increase circulation in our small blood vessels (capillaries) that make up 74% of our circulation and can account for 70,000 miles if laid out on the ground. When you increase circulation, you enhance the delivery of nutrients, red and white blood cells and oxygen to those cells. Metabolic waste products (toxins) are removed more efficiently, which can build stronger tissue, and increase rate of healing. Bemer is easy to use. It is approved as a class 1 medical device for general enhanced circulation and blood flow, concentration and mental clarity, stress reduction and relaxation. It can also enhance strength, physical fitness and energy. Following a 6 week basic program is best for most people because as the intensity increases each week, a different layer of tissue is affected. Intensity 1 and 2 address the superficial layers of tissue, which can create a relaxing effect, while levels 3-5 will affect more dense tissues such as muscles, and intensity 6-10 affects high density tissue such as bones, cartilage, tendons and ligaments. Most clients do not feel anything during a Bemer session since the technology affects the body at a cellular level. The system is equipped with a pad in which the client lays on, typically for 8 minutes and up to 20 minutes at the higher intensity levels. Bemer has accessories that can be placed around or muscles and joints that are causing you discomfort. Drinking plenty of water is advised, so your cells can be more efficient in delivering nutrients and filtering out waste products. With all the products, therapies, and medical treatments available on the market today, Bemer provides a safe, non- invasive alternative to increasing cell performance.